LNV Technology is known for its reliable products, which are developed with design standards and latest Technology. It is also known for fast and customized solution for product and process. 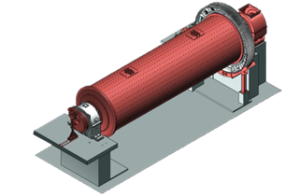 The mill is of two compartments, gravity flow mill consisting of a shell with end covers, supported on white metal lined bearings. Inner surface of mill shell is lined with wear resistant Hi-chrome material liners having a particular profile which provides required trajectories to balls inside mill to have maximum grinding efficiency. The ball trajectory and size of ball defines the mix of grinding operations that is impact (crushing) and attrition (grinding), and thereby will help in controlling the granulometry of mill product. These liners also protect the shell from ball impact & friction and thus safe guards the shell for maximum life. The journal bearings takes support from sockets seated in main bearings. Supporting surface of socket is lined with white metal and outer surface is a spherical surface provides self-aligning facility to socket.